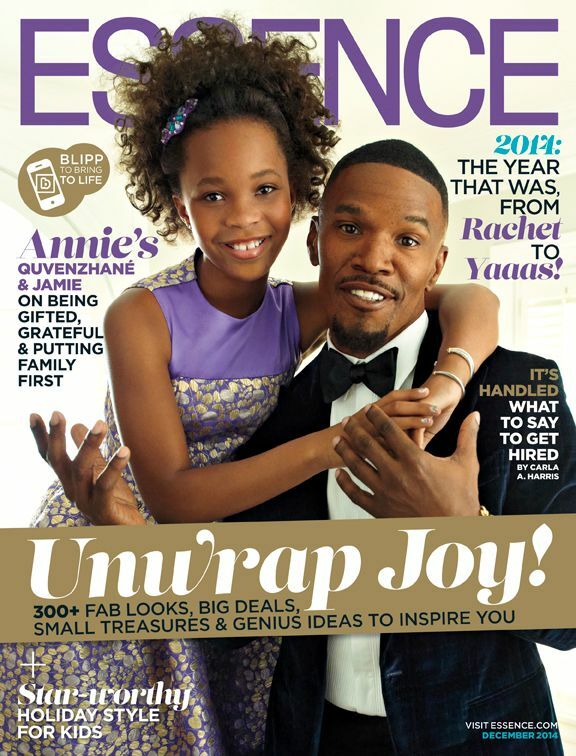 We're all excited about the upcoming holiday film Annie (Out December 19th) starring Quvenzhané Wallis and Jamie Foxx and the duo landed the cover of ESSENCE’s December issue. In a piece titled "Gifted & Grateful" Jamie and Quvenzhane (the face of Armani Junior) chatted with the magazine about their magical remake of the classic Annie, how much fun they had fun working together, handling show business, and how they each plan to ring in this holiday season. Also, we'll get to hear Quvenzhane sing. She told the mag, "Yes, that's me really singing". Adding to the holiday fun, this will be ESSENCE Magazine's first interactive cover as readers will be able to access additional media using the app, Blippar and holding their phone/mobile device up to the image of the cover. The December issue of ESSENCE hits newsstands on Friday, November 7th.